I enjoyed Shannan's Monday post on Fall Cancer Fighting Foods where she outlined the great benefits to eating more squash vegetables this fall. 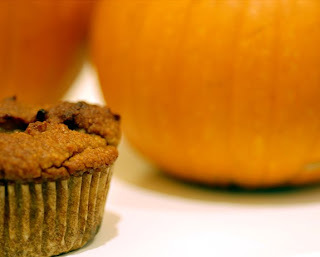 While I would encourage eating more whole roasted fall vegetables, I thought this pumpkin muffin recipe would be fun to share today. It calls for whole pumpkin and it's such a tasty treat. Did you also know that Traditional Chinese Medicine teaches that root vegetables and squash have great warming properties. We are encouraged to eat more root vegetables and squash this time of year to prepare our bodies for the coming winter. Not only do they have great cancer fighting qualities, but they may just prepare your body to fight off that bothersome cold and flu season! Combine flours, pumpkin pie spice, baking soda, ginger, and salt in a medium bowl, stirring well with a whisk. Make a well in the center of the mixture and combine the sugar, pumpkin, buttermilk, oil or butter, molasses, vanilla extract, and eggs stirring well with a whisk. Add sugar mixture to flour mixture, stir just until moist. Spoon batter into 18 muffin cups. Sprinkle tops of muffins with granulated sugar. Bake at 400 degrees for 15 minutes or until a wooden pick inserted in center comes out clean. Remove muffins from pan immediately; cool on a wire rack. *I found a place here in Michigan that will grind your flour when you buy it and they have a really nice whole-wheat all purpose flour that goes well in this recipe. **I'm not a big fan of canned foods so when time allows, I make my own pumpkin by taking a small baking pumpkin or butternut squash and baking it for about an hour in the oven until soft. I then scoop out the inside and use a cup for this recipe and then freeze the rest for later baking. ***Black strap molasses is an excellent source of manganese and copper, and also contains iron, magnesium, calcium, potassium, and Vitamin B6. It's basically all of the nutrition taken out of refined sugar in the refining process. Other options to use are maple syrup, raw honey or agave nectar. My son C. Everyone needs a handsome assistant when baking in the kitchen! Mike and I were just discussing how much we love all things pumpkin. Can't wait to try these!